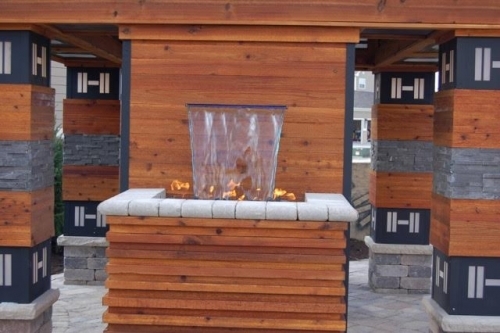 Looking to add a new water feature to your Carmel landscaping? 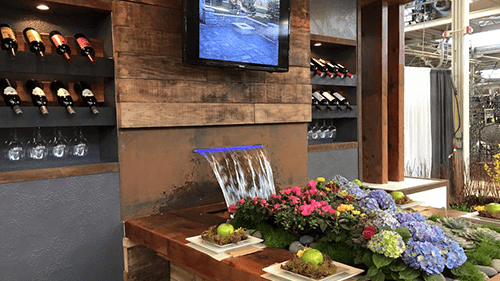 Country Gardens & Lawn Landscape specializes in designing and creating beautiful, inventive and sustainable outdoor living environments, including Water Features for your Carmel home. The experts at Country Gardens have been designing and implementing landscaping services for over 20 years. Everything we design is custom to our clients needs and desires. We like to make every feature we add to your property functional to the space you have available and complimentary to your home. 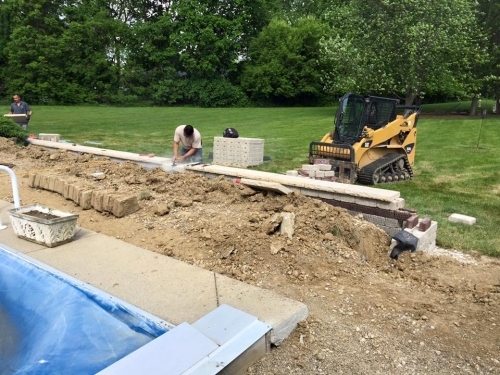 Ready to build a custom water feature in the Carmel area? 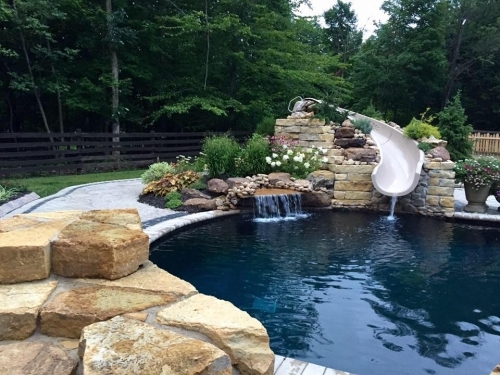 Country Gardens specializes in designing and installing custom water features such as pools, ponds and fountains to your Carmel home. Want to walk out your back door to an outdoor oasis? 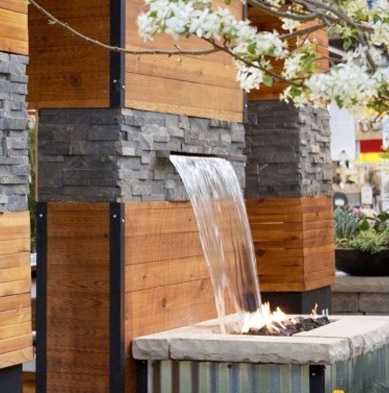 Adding a water feature will provide a soothing, beautiful new look and sound to your private outdoor living space. 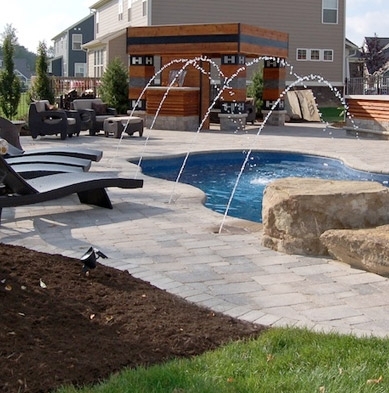 All of our water features will enhance and add value to your yard and home. We can build you a custom swimming pool or provide renovations to the pool your currently have. 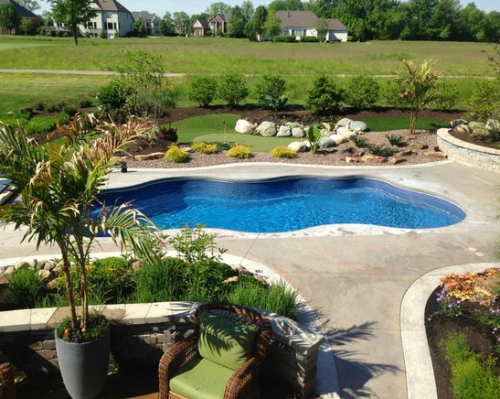 Your pool may need minor changes or updates from wear and tear or changes in tastes. If you’re looking for a custom redesign to correlate with other landscaping features that you may have have added to your Carmel home, we can provide those as well. Whatever your needs may be, we have the experience to renovate or custom install a brand new swimming pool for your enjoyment. Adding a pool will add value to your property and also provide an escape for the whole family on hot summer days. 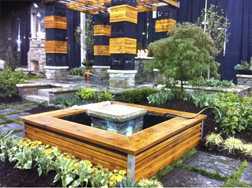 Using Country Garden for your Carmel water features has many advantages. Before installation begins, our experienced pool designers provide complete, in-home pool estimates. We will measure/survey your property, to consider factors such as pool shape, size and depth. 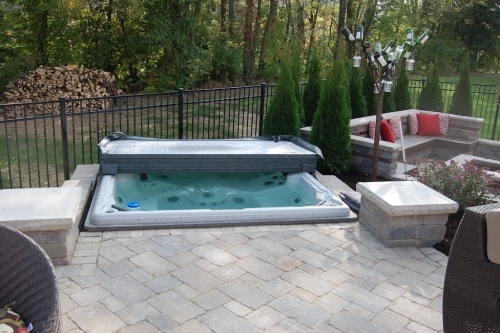 Next, we will collaborate all of the materials needed to design and install your new custom swimming pool. 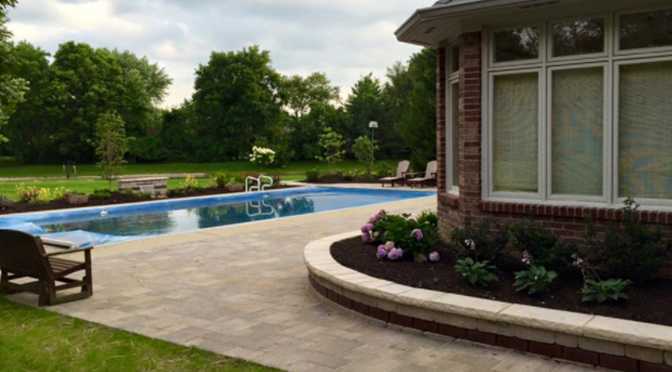 Additionally, we can provide quotes for any other features such as a pool deck or any other hardscape landscaping you would like to add to your yard. Our design team will create electronic designs for you to view and approve before any installation begins. We use state of the art technology that will bring your dreams to life. Computer-aided design (CAD) is the use of a wide range of computer-based tools that assist engineers, architects and other design professionals in their design activities.All our designs are carefully labeled with real photographs of each plant or hardscape material to be used. Digital Photo Imaging (DPI) is the process of taking a photograph and plugging in real photos of plants, trees, hardscapes from a computer based software. This process allows the customer to have a better understanding of how there landscape will look when finished. 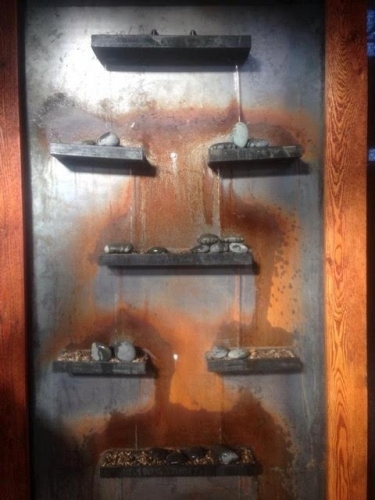 After approval of the design for your water feature, our team will go over all specifications and pricing. We are confident we can work with your budget and install your new custom pool in the time frame that works best with your schedule. Let us take over and you can begin to enjoy the backyard you’ve always wanted. These Carmel water features provide a calming sound and provide an outstanding opportunity to add enjoyment to your outdoor living space. The sights and sounds of flowing water will bring feelings of calmness and tranquility. The elegance of a custom fountain can bring an elegant and soothing environment to your home and landscape. Our landscape design can combine rocks, plants and liquid motion that you can view and enjoy year round. We use the highest quality of materials to build your fountain. We have pond or pond less water fountains. 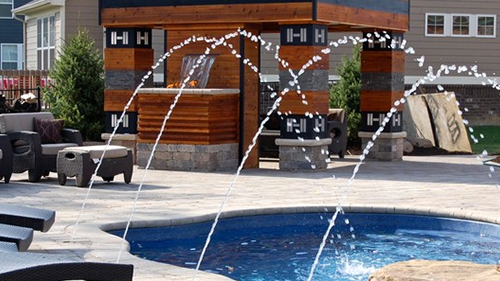 Whether you are adding a fountain for curb appeal or to flow into your beautiful outdoor pond, our fountains will compliment all of its surroundings and provide a soothing sound for a relaxing environment to your yard. Every installation will be approached with a one-of-a-kind mindset, since every feature will vary depending on requirements and desires from each Carmel client. We will select the proper filtration system and give you the best recommendations on how to maintain your new fountain year round. Adding a custom pond to your yard, will bring beauty and serenity for your family and friends to enjoy. Our ponds are designed to require low maintenance and are an energy efficient water feature. Our ponds start with proper design and a perfectly sized multi-staged filtration system to compliment your yard. Whether you are looking to add fish to your new pond or just plants and rocks, our experts will be able to design your pond for your desires and needs. They will also give tips on how to maintain the fish or plants so you can enjoy your new Carmel water feature for years to come. All of our features are designed from materials that will sustain all types of weather. If you are interested in working with Country Gardens, for your next Carmel water features project check out our featured projects that showcases some of our work. If you’d like to get in touch with us to schedule a consultation call 317.339.7847 or email [email protected]. Fill out our online questionnaire to get a quote started today. We look forward to working with you for your landscaping needs.